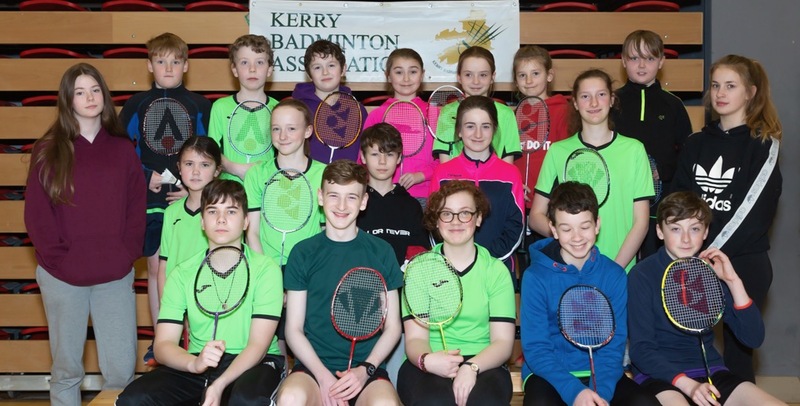 Four more county titles were up for the grabs in Killarney on the first day of March as over 80 players contested the Men’s and Ladies Division 2 and Division 4 Kerry County Championship Doubles titles. In the Ladies Division 4 Section Moyvane duo Breda Flavin and Louise Behan defeated the Galvin sisters Jessica and Fiona of Killarney in the quarter final before overcoming the challenge of Rita McCarthy(Listowel) and Josie Gilbert (Ballyheigue) in three sets to reach the final. Meanwhile on the other side of the draw the Guiney sisters of Listowel (Grace and Valerie) defeated Aoife Bowler (Moyvane) and Adele O Brien (Killarney) before beating Ballyheigue pairing Siobhan Colbert and Kathleen Gilbride to book their place in the final. The final itself was an extremely tight affair but in the end the Guineys of Listowel were celebrating as the scores finished 24-22, 21-19. Having won a singles title a few weeks ago Valerie Guiney is still in contention now for the treble when the mixed championship takes place in April. At the Kerry Division 4 Ladies Doubles Badminton Championships held Killarney Sports & Leisure Centre on Friday 01 March. 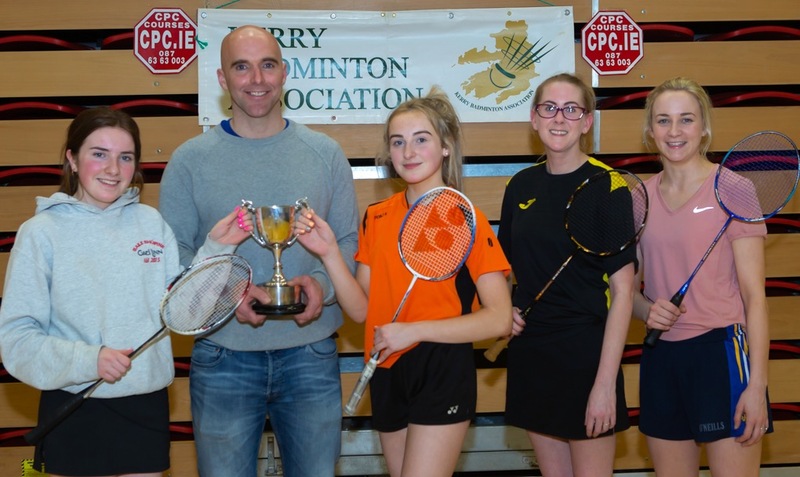 This photograph shows L/R, Valarie & Grace Guiney Listowel being presented with the Division 4 Cup by Tom Bourke Chairman Kerry Badminton after they won the Division 4 Ladies Doubles Badminton title along with Runners up Louise Behan & Breda Lane, Moyvane. The first round of the Men’s Division 4 competition saw the recently crowned Division 5 champions Padraig Hanrahan and Radek Choromoski of Moyvane face the 2017 Division champions Brendan Carroll and Paudie Barrett of Causeway. The Causeway pairing prevailed before overcoming James Sheehan and Anthony Barrett of Listowel in the quarter final. They then overcame seeded Listowel pairing Paul Hayes and Jack McElligott of Listowel to reach the final. Meanwhile the Ballyheigue seeded pairing of Kevin O Mahony and John McDonnell overcame John Newman and Barry Callaghan of Moyvane and Listowel duo Mike Reardon and Tom Rice to ensure there was a local derby element to the final amongst parishes that tend to usually reserve such sporting rivalries for the hurling pitch. O’ Mahony and McDonnell took the first set 21-14 but Carroll and Barrett fought back taking the second set 21-17. However the Ballyheigue pairing never seemed to be in trouble eventually winning the third and the title 21-16. Like Guiney in the ladies O Mahony still is on track for a treble when the mixed championships take place in April. With only six pairing contesting the Ladies division 2 championship Saorcha Fitzgerald and Helen Browne of Moyvane reached the final after beating Brid Murphy and Ruth Concannon of Kingdom. Meanwhile Niamh Hickey (Killarney) and Elaine Hudson (Moyvane) reached the final by beating Lynda McCarthy and Fiona Boyle of Ballyheigue. In the final Hickey and Hudson took the first set rather easily 21-11 but the Moyvane ladies put up a great battle in the second set before going down 21-18 meaning glory for Hickey and Hudson. Brendan McGovern (Annascaul) and Aaron Tan (Kingdom) defeated Kieran Crehan (Killarney) and Cian Liston (Listowel) in the quarter final of the Men’s Division 2 championship. They then reached the final by beating Timmy Noonan and John Mulvihill of Moyvane. On the other side of the draw Listowel pairing Paddy Redmond and Andy McMahon overcame Noel Gilbride (Ballyheigue) and Chris McCarthy (Moyvane) before beating Kingdom pairing Aidan McCarthy and Mariusz Tsuski to reach the final. Unfortunately, the final was a one-sided affair with McGovern and Tan winning rather easily in the end 21-10, 21-15. McGovern will also have an opportunity in April of winning the treble having also wo the singles title in February. 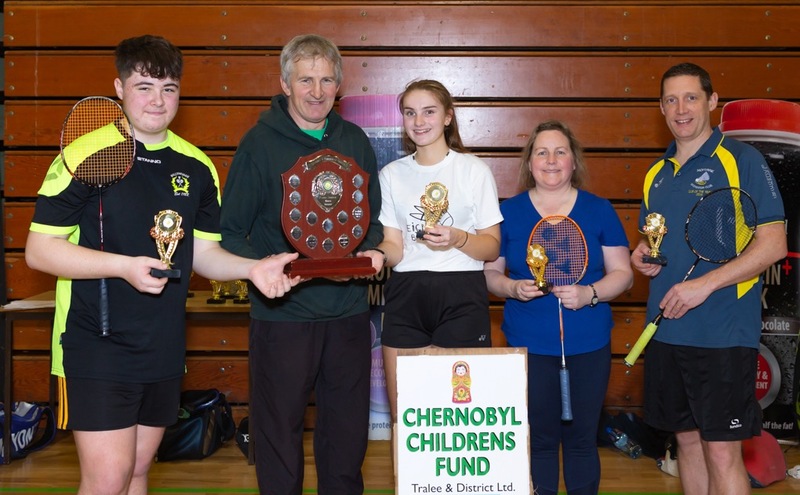 The Paddy Sugrue Badminton Tournament took place at Tralee Sports Complex in aid of the Chernobyl Children’s Trust last Sunday (March 3rd). Well done in particular to Tom Clear for organising the event and raising some funds for such a worthy cause. This photograph shows the winners of Division 5 competition…. L/R, Aidan Reidy,Ballyheigue & Eva Browne Moyvane being presented with their Trophys by Tom Clear Chernobyl Childrens Fund committee along with runners up Deirdre McAuliffe Listowel & Dan Browne Moyvane. Listowel were crowned club champions and presented with the club tournament shield.